One of the oldest characters of Christianity. In Greek, "fish" - Ίχθύς - the acronym of the Greek phrase "Iησοvς Χριστος Θεov Υιoς Σωτήρ" - "Jesus Christ is God's Son, Savior." 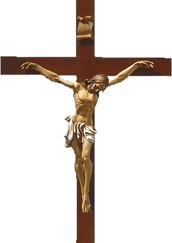 In the Christian church the cross appears only in the IV century, after the Roman emperor Constantine the Great in 312 had a vision in the form of a cross, which he considered a sign of the upcoming victory. Trying to unite the troops consisting of Christians and pagans, Constantine was the initiator of the spread of the cross as a symbol, for on the one hand he pleased Christians, whose religion was legalized by the state, and on the other hand for the Gentiles was a symbol of the favor of their sun god whom they revered. On the large horizontal crossbar, the hands of the Savior Jesus Christ were nailed. The upper small horizontal crossbar means the tablet on which "Jesus of Nazareth the King of the Jews" was inscribed. The slanting crossbar means the two crucified next to Christ, where the end of the crossbar is pointing upwards means a forgiven robber who has fallen into paradise, and the end of the crossbar is pointing down - another nailed that has fallen into hell. The main thing is Jesus on the cross. The cross is without Jesus, because He is risen. 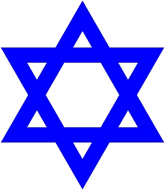 The original symbol was the star of David. And this is not accidental. Christianity was part of Judaism, and its advanced part. Jesus came to Israel. He visited the temple in Jerusalem, visited synagogues and was circumcised. It was then that Christianity decided to disown from its roots.